Our mission is to identify and collectively solve issues adversely affecting low-wealth communities throughout Miami-Dade County. Hear from our CEO, Board Chair, clients and staff about what Catalyst Miami stands for and what they do to make Miami-Dade a better place. We provide a number of free financial services to help thousands of people annually improve their financial security. These services are provided in English, Spanish, and Haitian Creole in one-on-one appointments with certified financial coaches. Services include credit building, rewards for savings, zero-or-low interest emergency loans, tax preparation, and more. Two of our staff members and a client traveled to Washington, D.C. earlier this year to meet with staffers from Senator Bill Nelson's and Senator Marco Rubio's offices to advocate for their support of the Voluntary Income Tax Assistance Program, SNAP, Credit programs, and the Consumer Financial Protections Bureau. Public Allies Miami is headquartered in south Florida by Catalyst Miami. This photo shows our last cohort of Public Allies at one of several trainings where they learn 21st Century leadership and workplace skills from leaders of diverse backgrounds. Topics include learning new ways of responding to problems and initiating solutions that encourage shared responsibility, alliance-building, and using existing resources. These are some bright young graduates of the CLEAR Miami youth program on climate resilience. 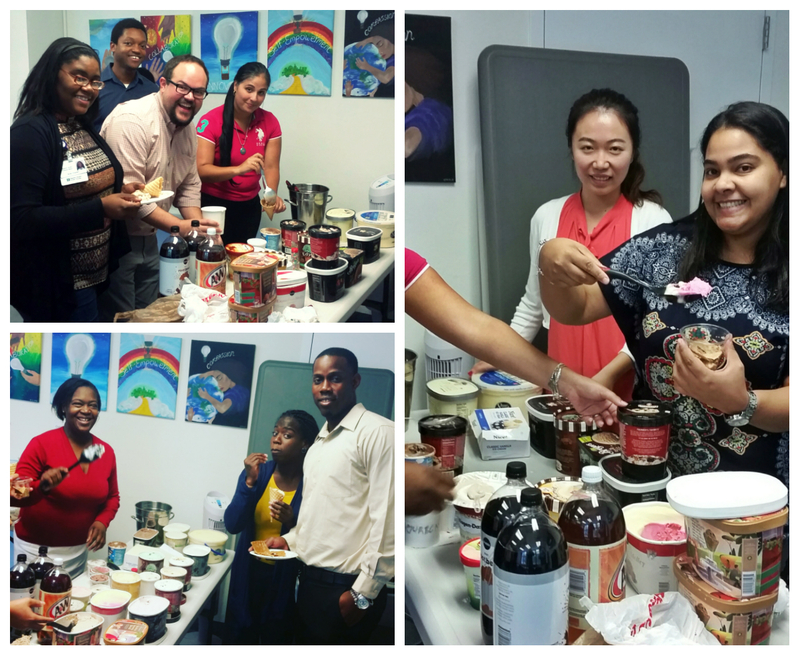 Having some fun at a staff meeting with ice cream! We connect low-wealth families to preventative healthcare options and basic needs services; and we provide financial services such as free tax preparation, credit building, zero-or-low interest emergency loans, and comprehensive financial coaching. Everyone can lead: at home, in the classroom, in the community. We teach individuals about climate science, local climate change threats and solutions, and how to find their voice to advocate for better public policy to address the threats. Graduates have gone on to become climate resilience educators, leaders, and innovators in their own communities and beyond. Public Allies Miami is a 10-month, paid AmeriCorps apprenticeship that engages young adults with passion for social justice and leadership skills. Allies are placed in local nonprofit organizations where they are able to gain professional experience that builds their career path, while advancing the organization’s capacity to further its mission. For over 10 years, we take an annual trip to our State Capitol where our program graduates and community partners travel with us to Tallahassee to put their advocacy skills into practice. The trip takes place during the Florida Legislative Session. Fellows of the program have scheduled meetings with the Miami-Dade County delegation and their staffers, as well as other members of the Florida legislature to discuss the most important needs of their families and communities (which often includes housing affordability, healthcare access, climate resilience funding, higher pay for teachers). Last year, Irma left thousands of south Florida's low-wealth residents in financial turmoil not being able to get back to work or with significant property damages. We're working with Miami-Dade County to upgrade the resiliency of select County buildings and provide more social services and civic opportunity in Homestead, Overtown, Miami Gardens, Little Haiti/Little River, and Hialeah. Learn more about Catalyst Miami Inc.